For me, Maggie Stiefvater started out as 'Maggie Who?' and quickly became 'Gimme more!' I have devoured every book of hers that I've gotten my hands on and I'm still anxiously awaiting more. She is a master of vivid imagery and character creation. She keeps everything realistic with just a hint of the unusual. She effortlessly pulls you into a world that isn't your own, but it's close enough that you find yourself comfortably lost and not wanting to return where you belong. 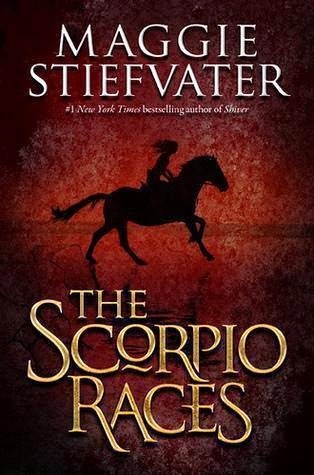 The Scorpio Races is one of Maggie's earlier books. The Scorpio Races are run once a year on a tiny island. This is no ordinary race, however. Water horses or captured as they emerge from the sea and then ran in the race. The winner each year receives riches and accolades, sort of becomes the hero of the island. In this book, we cover the races on the year that Puck Connolly decides she must enter. Puck's life is a shambles and she believes the only way to save her world is to not only enter the races, but to win. Puck's no idiot though. She knows that people die in these races. She knows that she's the first girl to ever enter. Also, she knows that no one can beat Sean Kendrick. None of that matters though, since it's her only hope. As usual, I was lost in Maggie's world. It's chilly November and I'm on a beautiful, tiny island surrounded by rich characters. I'm not a horse person. In fact, I'm a little on the terrified side. Water horses, however, are a different thing. Don't get me wrong, they're terrifying as well, but they have a beauty and grace to them that I'd never imagined before. They have a mythical quality...a black widow lure. Even though everyone knows how dangerous and wild they are, no one can dispute the magic of them. If you've read anything by Maggie Stiefvater, then you already know you're going to love this. If not, this is actually a great place to start. It's a chilling and haunting tale of survival and love. The narration is absolutely perfect. This is a wonderful story, beautifully told, you won't be disappointed.